German HD+ Deutschland viewing cards and decoders are now available from London SatMan online shop and for full satellite dish system installations in and around London. HD+ is a package of high-definition digital satellite TV channels for German-speaking viewers. HD+ provides a broadcast platform from satellites at the Astra 19.2°. With a selection of channels covering many genres the HD+ package will suit the interests of the whole family. With HD+ you have no contract or monthly fees you simply pay a one off fee and enjoy HD+ for 12 months. After one year the HD+ card can simply be bought or renewed. London SatMan has chosen the Humax HD Nano Basic HD+ for the German satellite TV installations and all its German clients wishing to upgrade their satellite receiver.With the Humax HD NANO Basic enjoy all the free to air HD German satellite TV channels as well as the mainstream programs offered by leading commercial broadcaster, in stunning high definition quality. 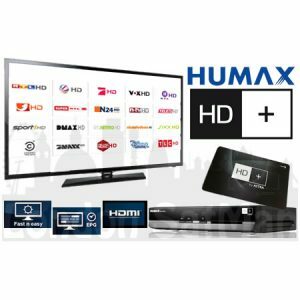 The genuine HD+ card and decoder Humax HD Nano Basic HD+ will be on sale from Monday 17 November priced £149.95 which include 12 months of viewing of the HD+ bouquet.